Complex and expensive tests are necessary in order to develop aircraft. The subsequent maintenance is also very costly for the airlines. The German Aerospace Center (DLR) is seeking to change all this through the use of supercomputers and the evaluation of huge amounts of data. Aviation is facing a digital revolution. Even today, modern jumbo jets are rather like flying computers. However, many years pass by between the time a new aircraft starts to be designed and the moment it actually goes into operational use in the air. Usually, it takes eight to ten years. The fact that the engineering design is a complex task is one of the reasons for this. Aircraft manufacturers also have to comply with extensive aerospace approval requirements, with exhaustive testing. But all that could change in the future. Researchers from the German Aerospace Center (DLR) are seeking to enable computers to perform a large part of the tests. "Our goal is not just to use computers to design aircraft but also to test and certify them," explains Prof. Norbert Kroll. He is the head of the Simulation Center C²A²S²E at the DLR Institute of Aerodynamics and Flow Technology in Braunschweig, Germany. The virtual tests that are being conducted here are intended to shorten development times and reduce costs, but in addition, help evaluate new technologies more rapidly. The key to this is Big Data. Kroll, however, prefers to speak of Data Science, because in his view, "Big Data" is associated strongly with the aspects that make up Internet giants such as Google and Facebook: the collection of user data to present personalized content. As Kroll points out, "These are huge amounts of data but very simple data. In our field, however, we have somewhat smaller amounts of data, but very complex, heterogeneous data sets." In order to characterize an aircraft, it takes about one million data sets with multiple related pieces of information. 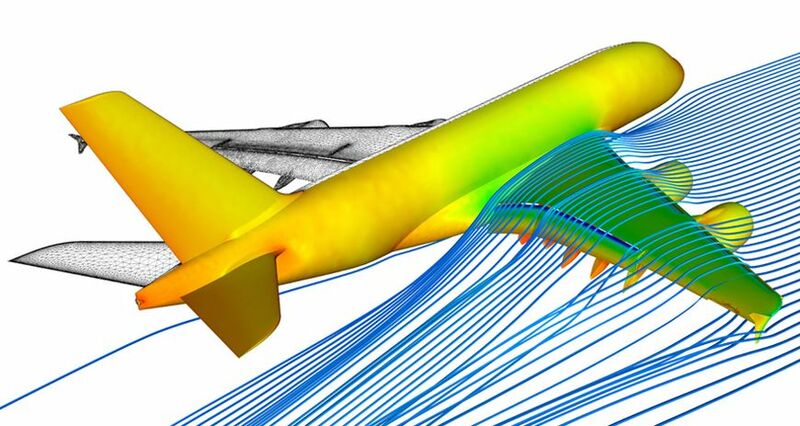 These include, for example, pressures and velocities of airflow in a diverse range of flight simulations. In order to advance the vision of virtual aircraft approval, data from current flight tests as well as from previous aircraft tests and wind tunnel tests are also included. In order to do this, DLR also works closely with industrial partners such as Airbus. Powerful computers are necessary to process these huge data sets. At C²A²S²E, in Braunschweig, a supercomputer is specifically used for this purpose, to jointly simulate aerodynamics and structural interaction, within hours or days, through the parallel distribution of computing tasks over a wide variety of processors. "The increase in computing power allows us to pursue new paths which previously were not a subject for consideration due to the effort they incurred," notes Kroll. This not only opens up new perspectives on aircraft development and approval but also on the maintenance of the jet engines that are subject to high stresses and loadings day in and day out. As Uwe Zachau, Head of Industrial Engineering at MTU Maintenance, notes, "The biggest impact of Big Data is that maintenance, repair, and overhaul are raised to a predictive level." For a long time, airlines and maintenance engineers have been collecting and analyzing various engine data, such as oil pressure, fuel consumption, and exhaust gas temperatures. This enables problems with individual components to be detected and resolved early. In the future, by combining with further data from the operation of a whole aircraft fleet, such as operational area, flight altitudes, and airspeeds, it will be possible to identify underlying principles or laws which were previously unknown. This would make it possible to predict how long a particular engine will still remain in a state ready for operation. Planning of maintenance tasks and spare parts logistics will become even better. "In the maintenance sector, Big Data is currently the hot topic of discussion for everyone," comments Zachau. However, the required technologies and programs are still under development. "The biggest challenge is to merge the relevant information in order to generate enough data points. Only then can we determine specific patterns over and beyond various engines, regions, and operating conditions," explains Zachau. Regardless of whether it is aircraft approval by computer or predictive maintenance: It will still take some time before either will become part of day-to-day life. But from his research at DLR, Kroll is certain of one thing: "Data Science combined with the highest level of computing power will revolutionize the world of aerospace product development." Modern science can hardly be conceived of without analyzing huge amounts of data. New developments in the field of digital data processing open up entirely new opportunities in data-based research. This applies to all areas of research of the Helmholtz Association. In this series, we intend to show how Data Science works based on specific examples. Alexander Gerst in command of the ISS, a mole landing on Mars, and a launch toward Mercury: These are just three major events in space exploration we have to look forward to in 2018. What follows is an overview of some of this year’s highlights, which are increasingly being shaped by private initiatives. Scientists are working to grow fresh vegetables in a greenhouse surrounded by perennial ice. The experiment will supply the winter crew at Neumayer Station with fresh food, but it is primarily designed to provide experience and data for future Mars missions. How dirty is diesel really? Most people think diesel engines are significant contributors to air pollution. But modern models produce hardly any particulates or nitrogen oxides. We spoke with Thomas Koch about a technology that has fallen into such disrepute. The aim of the European Copernicus Project is to deliver high-resolution images of virtually every place on earth – none of them older than five days and as a complimentary service that is accessible to everyone. The launch of the Sentinel-2B satellite means that the core of the mission has now been completed. The Planet Earth in 3D, and more precise than ever before! Research scientists create, with the aid of two satellites, a map of the world that has 30 times more precision.